Being productive at work is a tough task. Even if you manage to block digital distractions, you cannot work all the day. That’s why it’s recommended to take regular breaks during your work. But, you’ve to make sure that you don’t get carried away by the break time. Pomodoro Technique was developed to address all these challenges at once. It does so by introducing a productivity-friendly schedule. You set up a working schedule of 25 minutes. After that, you have to take a 5-minute break. Once you’ve completed four Pomodoro sessions (2 hours in total), you can take a bigger break (I give myself 20 min). It’s scientifically proven, and I find it really effective to stay productive. That having said, you cannot rely on your Smartphone clock or the Mac time icon for checking the time. That’s why we need Pomodoro Timer apps. Fortunately, there are a few good Pomodoro apps for Mac. Depending on functionalities, UI and the whole impact on workflow, you can find the best one. In this article, we have listed some of the most popular and effective Pomodoro timer apps for Mac. As said earlier, we have at least one tool for everyone out there. It should help you to find the best one. Be Focused Pro is one of the most popular Pomodoro apps for Mac out there. The best part is that it has an integrated task manager as well. 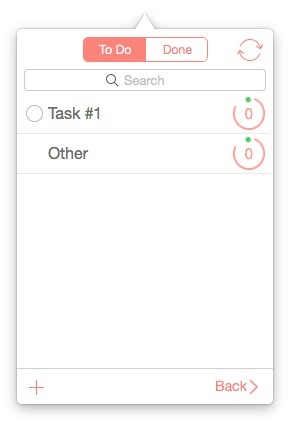 Once you open the app, list all the tasks you have to do, and then start individual tasks as per the Pomodoro technique. 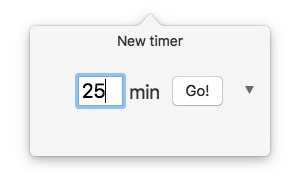 If you don’t want those features, you can use Be Focused Pro as an easy-to-use 25-minute timer as well. The interface is minimal and does not distract you. It does not have a fully-fledged window, but you can manage everything from the menu-bar icon. When it comes to customization aspect, Be Focused Pro does not disappoint you. You can decide the length of the intervals and how often they do appear during the work hours. By default, everything is set according to the Pomodoro technique. Another impressive point in Be Focused Pro is the ability to track your progress. You can track how productive you were by looking at the Reports. 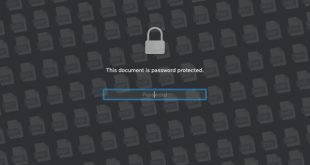 What’s more, you can even export these reports to CSV. Since the app is available for iOS, you can benefit from Sync too. We would recommend it for professionals who value their time very much. Be Focused Pro is the best solution when you’re hell-bent on productivity. No matter what you’re doing, this app lets you manage different tasks with proper intervals. We also liked the fact that it offers an integrated task manager. 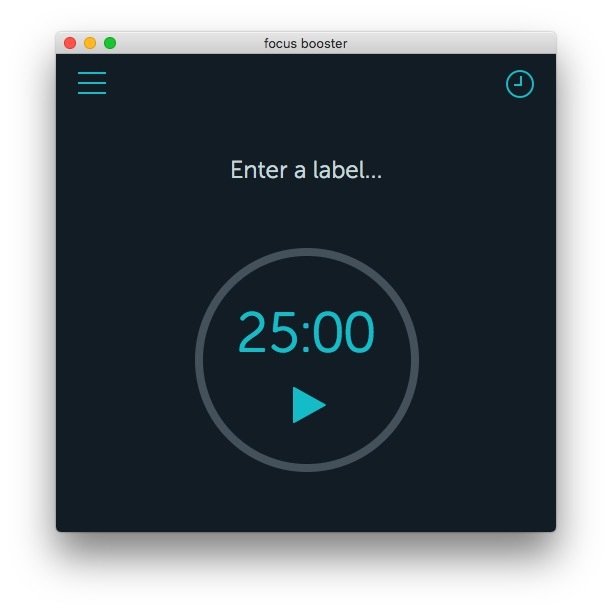 If you are looking for a multi-platform Pomodoro app with awesome features, Focus Booster is a great option indeed. Apart from Pomodoro-based timers and breaks, you will have access to Timesheets as well. That is, every single minute you work on a project will be counted. While you can use the service on the web or desktop, the Mac app is good enough. Coming to the UI, Focus Booster has kept everything minimal. Unlike the previous app, Focus Booster has an actual window-based interface instead of the menu-bar icon. You will see the running timer on the screen, but there is also a Mini Timer. 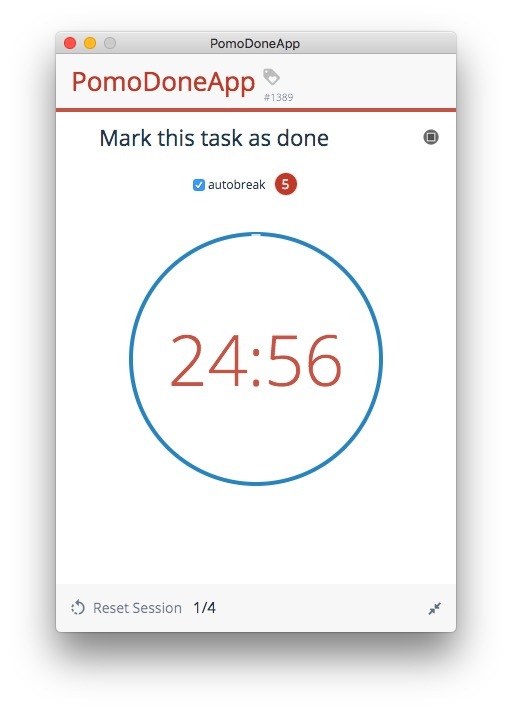 In the Customization department, you can change the basic things like Break Time, Timer duration and notification preferences. Focus Booster has a Dark Theme as well order to use Focus Booster, you should have an account for the service. 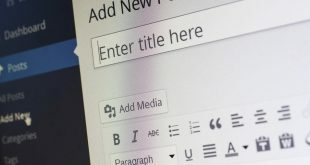 Only after signing in can you start working on projects. 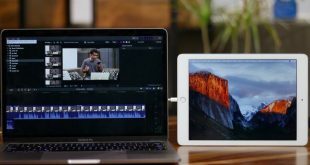 It means everything you do will be synced with other apps, for iOS, Android and even Windows. Not all features are available in its free version though, to get features like Data Export and Unlimited Sessions of Pomodoro timer, you have to pay $4.99 per month. If you need more control over timesheet and associated data, Focus Booster would be the best option. The app offers the standard Pomodoro timer experience, but that’s it. We’d recommend it for users who would not mind spending a bit more for time-tracking. 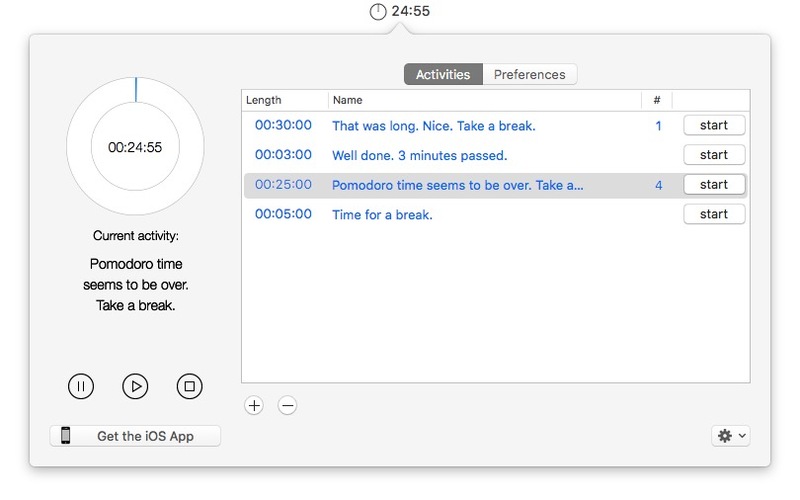 PomoDoneApp is one of the most popular timer apps for Mac and other platforms. Using the app is like a piece of cake. Once installed, you can launch the app and start working. Because it has an integrated task manager inside, you can start working on a single project itself. 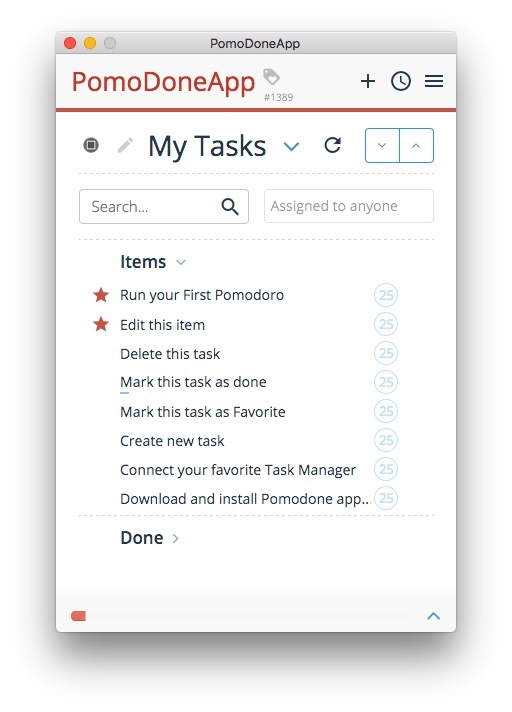 PomoDoneApp does not have a minimal UI, but, that’s because the app has a few features in the Task Management department. However, at a glance, you can know about to-do tasks and start them. 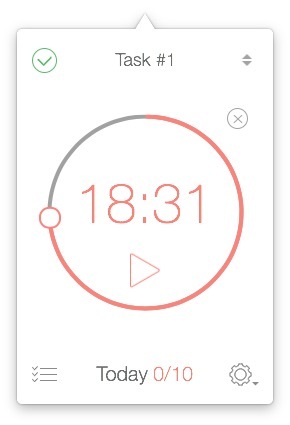 Instead of fixing on the 25-minute span, PomoDoneApp lets you choose a variety of timers — 5, 15 or 25. This is what we love about PomoDoneApp. If you want, you can turn it into the complete space for managing your work and projects. On the other hand, if you are looking for something simple, you can use the app for Pomodoro timer setting. Coming to the Timer part, however, we liked the seamless nature. PomoDoneApp will work smoothly until you complete the four Pomodoro sessions. PomoDoneApp is the best Pomodoro app when you need complete focus. It has been made with the sole intention of Pomodoro management. While the free version gives you a clean app, you have to pay a monthly subscription for team-based online features. At the core, Tadam is a minimalistic timer app for Mac, which promises to boost your productivity. What I love about Tadam is that it focuses on the right areas. 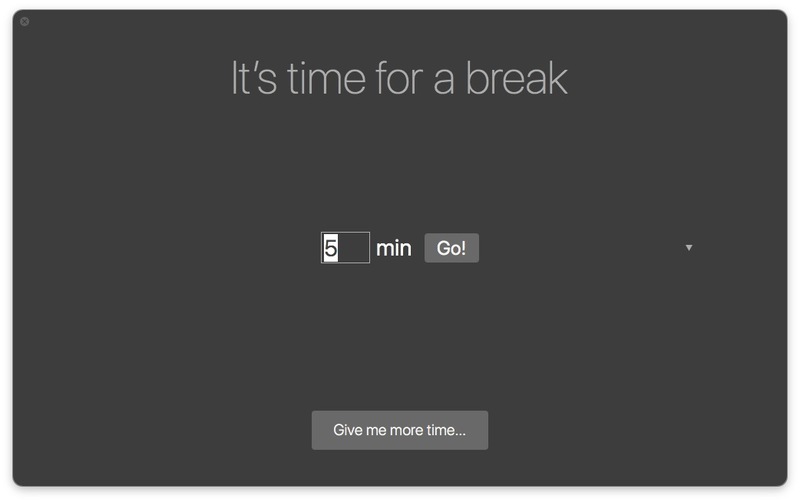 It has an awesome way to let you know that it’s time for a break. Tadam does not have much of a User Interface. It stays in the menu bar. Just click on the icon and you can enter the length of the timer. Once the timer is exhausted, you can get the break for 5 minutes. It, however, has a fully-fledged window for notifying the break. Even with this simplicity, Tadam has support for keyboard shortcuts. You can master these keyboard shortcuts if you need quick timer management. There are also some superb features we loved: for instance, Tadam notifies you when you are almost near the end. You can actually add a few more minutes if interested — it’s not the Pomodoro way, though. It’s one of those Pomodoro apps that make you take a break. Tadam is for everyone. It does not matter whether you’re a geek or a normal user. There is always a reason to use this app, even if not for Pomodoro. The best part about Tadam is that the app does not have anything to get you distracted. So, you keep working and taking breaks. It’s my personal favorite. 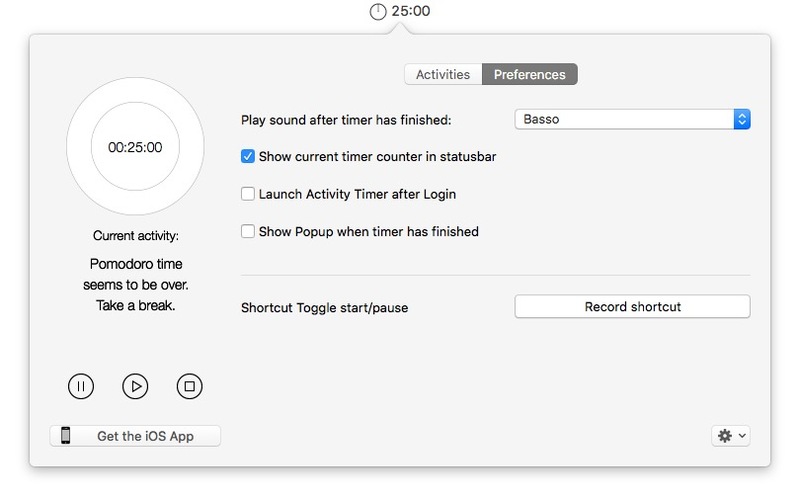 Activity Timer is not a Pomodoro-specific timer for Mac, it’s more of general timer apps. However, it does comes with a preset for Pomodoro Technique. That is if you are trying to boost your productivity like never before, you can simply launch the Pomodoro timer. The timer will repeat 4 times, making it a full Pomodoro session. Coming to the UI, Activity Timer does not have a fully-fledged window. Anything and everything needs to be managed from the menu-bar window. You can list out the popular presets, start or stop the timers and even check out the Preferences section. Although Activity Timer has an iOS counterpart, it does not offer options for content sync. But, if you ask us why we love Activity Timer, we’d say it’s because of the workflow. It’s really awesome to use Activity Timer despite the huge number of features. The notifications work fine and you can even set up custom messages to display when it’s time for a break. And we love the fact that you can do all these from the menu-bar. Activity Timer is the best option if you are looking for a general timer with proper customization. Although the app offers you complete control over the Pomodoro technique and customization, it does not consume many resources. 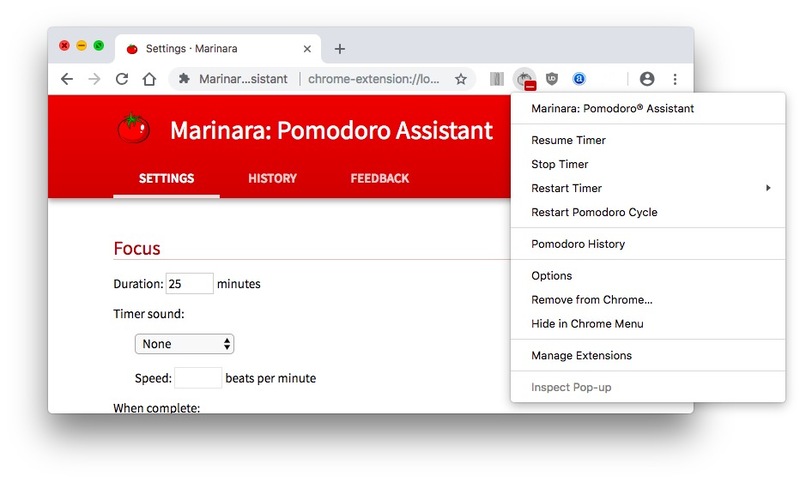 Unlike the others, Marinara is a chrome app (don’t worry, it runs offline). The way it works is pretty simple, simply install the app, click on the Pomodoro icon next to the browser’s address bar, the default timer is set to 25 mins but could be changed from Settings. Set your short break and long break length. Choose sound or screen notifications. And start doing your work. It comes with a pack of sound notifications, but what I really like about the app is the history, which you can import and export. If you constantly juggle between a Mac and PC, then it’s time for you to look for a browser-based Pomodoro timer. And Marinara fit the profile easily. Pomodoro timers work best for work which is independent of other people. For example, I’ll use a Pomodoro timer for writing my articles, but not during a sales call or brainstorming with my team; as you can’t control or quantify its results. Also, avoid 10 Pomodoro or more in a day. If you do, the work quality will suffer. There is only so much productivity you can achieve in a day. So don’t push it. Start with 4 Pomodoro timers a day and avoid all kind of communication and distraction. Also, take breaks. It tempting to go with the flow, but your mind need rest to stay productive. So, yes, take frequent breaks. Which is the best Pomodoro App for Mac? So, we have listed the best Pomodoro mac apps for almost every need. Sure, we’ve done some comparison as well, so that you choose the best tool. Tadam, despite being our favorite, may not have many functions that people are looking for. For instance, if you need an integrated task manager, PomoDoneApp for Mac is the best option. 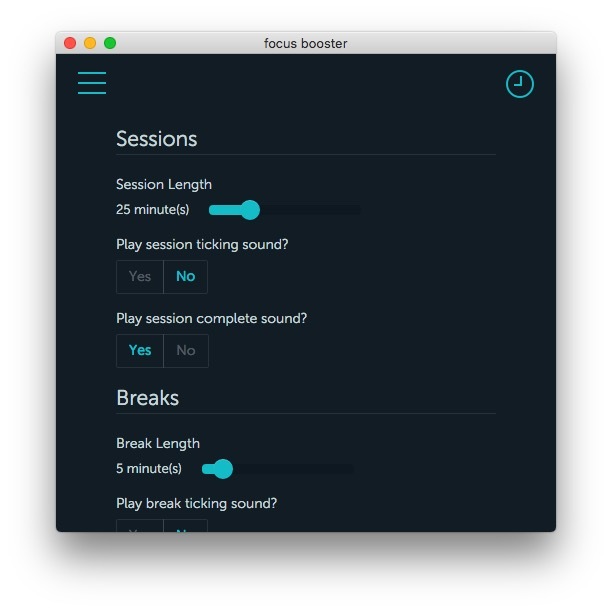 On the other hand, we would recommend Focus Booster if you need enterprise-level options and timesheet support. The point is, all these tools would work according to the Pomodoro technique.